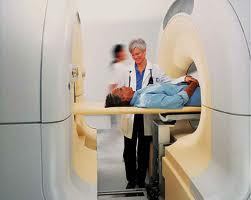 Positron emission tomography (PET) and computerized tomography (CT) are both modern imaging tools that allow healthcare professionals to identify the site of cancer within patients to facilitate more effective treatment recommendations. The highly sensitive PET scan images the biology of disorders at the molecular level, while the CT scan provides a detailed picture of the body's internal anatomy. The PET/CT scan combines the strengths of these two well-established imaging modalities into a single scan. The CT scan is able to perceive and concentrate on changes in the body structure or anatomy, such as the size, shape and exact location of an abnormal growth, tumor or musculoskeletal injury. A PET scan is very different from ultrasound, X-ray, MRI, or CT scan. A PET scan allows the doctor to distinguish between living and dead tissue or between benign and malignant disorders. Since a PET scan images the biology of disorders at the molecular level, it can help the physician detect abnormalities in cellular activity at a very early stage, and even before anatomic changes are visible. Alone, each imaging test has particular benefits and limitations, but by combining these PET and CT scanning technologies, physicians can more accurately diagnose, localize and monitor cancer, as well as heart disease and certain brain disorders. PET-CT has revolutionalized many fields of medical diagnosis, by adding the precision of anatomic localization to functional imaging, which was previously lacking in pure PET imaging. Although the combined device of complex PET-CT parts is considerably more expensive, it has the advantage of providing both functions as stand-alone examinations, being, in fact, two imaging devices in one. A PET-CT scan helps medical professionals diagnose problems which determine the best approach for treatment or monitoring progress. Cancer cells grow very quickly and growing cells use glucose as a primary source of energy. The faster the cells grow, the more glucose is consumed by them. A PET-CT scanner detects where positrons are being produced from within the body and provides images that map the locations. PET FDG mapping is combined with a CT image’s structural detail in order to identify both the presence of disease and its precise location. Combining the two techniques greatly benefits the patients as physicians can not only tell which cells are cancerous, they can pinpoint where the cells are, so they can more effectively develop the proper treatment plans. To determine if a cancer has spread in the body. To assess the effectiveness of a treatment plan, i.e. to determine if a cancer has returned after treatment. To find out about blood flow to the heart muscle. To establish the effects of a myocardial infarction. To identify areas of the heart muscle that would benefit from a procedure such as angioplasty or coronary artery bypass surgery (in combination with a myocardial perfusion scan). To evaluate brain abnormalities, such as tumors, memory disorders and seizures and other central nervous system disorders. To map normal brain and heart function. MedWOW, the multilingual global medical equipment platform, offers a large selection of both new and used PET-CT combination scanners for sale from inventories all over the world. Currently featuring PET-CT scanners and PET-CT parts from Esaote, GE Healthcare, Hitachi, Philips Siemens and Toshiba, locating even difficult-to-find items is easier than ever. If there is a particular PET-CT scanner or PET-CT part than you can’t find in MedWOW’s representative inventories, you can post a request or take advantage of any of MedWOW’s location services. huge for me. I am taking a look ahead in your next submit, I will attempt to get the hang of it!